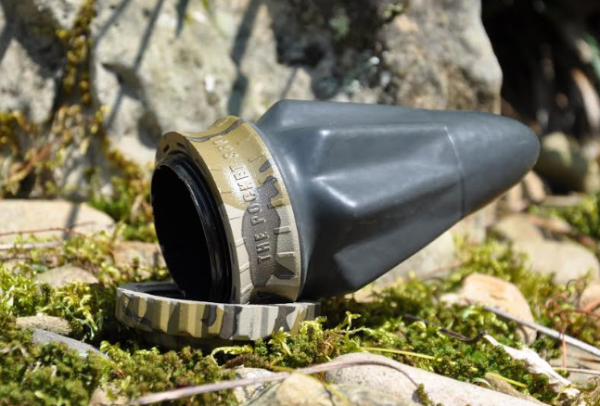 WEST POINT, MS – Mossy Oak announces The Pocket Shot and Pocket Hammer are now available in Mossy Oak Original Bottomland. The Pocket Shot is the next evolution of the slingshot and is designed for hunting small game, bowfishing, and recreational use. The Pocket Shot is the company behind both The Pocket Shot and The Pocket Hammer. The slingshots feature a patented, circular design and two different options for grip during use. The Pocket Shot is five inches in length while in use but measures only 2.3 long and 1.3 inches wide when collapsed. 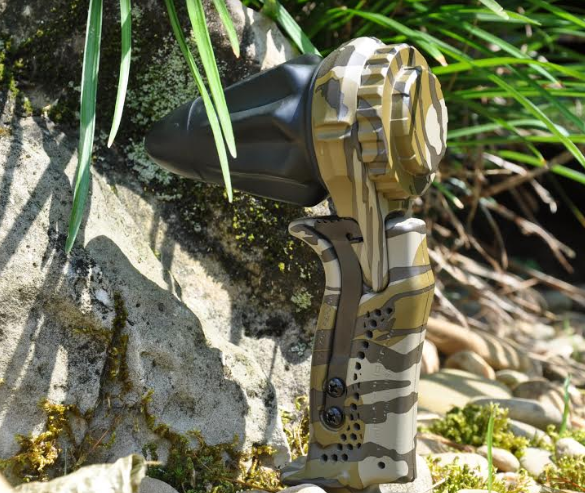 The Pocket Hammer was created for use with a vertical grip for increased comfort and an edge in accuracy. Both models are designed for durability and longevity. These modern slingshots are not toys; these are not the slingshots of your childhood. The Pocket Shot delivers significant power and can be loaded with a variety of projectiles. Suggested loads for the slingshot include .25 air-rifle pellets, 1Ž4-inch and 5/16-inch steel balls, paintballs, chickpeas, and miniature marshmallows. Projectiles with ragged edges are not recommended for regular use due to the decreased life expectancy of the device’s rubber pouches. However, in a survival situation or for limited periods they can be loaded with pebbles and .177 steel BB pellets. The slingshots’ features include a pull weight of 23 pounds for The Pocket Shot black rubber pouch and 27 pounds for the blue rubber Pro pouch. If you want increased velocity, you want the Pro; the blue Pro is manufactured from thicker rubber for speed and a longer life. The standard black pouch is capable of speeds up to 275 feet per second, while the blue Pro is rated for speeds between 300 and 350 feet per second. Draw-back length of the black pouch is an average of six inches, while the blue pouch can be drawn back between eight and ten inches. Pouches are replaceable. Hunters and recreational users interested in an accurate slingshot will enjoy The Pocket Shot and The Pocket Hammer for their ability to strike 9-inch by 9-inch targets at distances up to 30 feet. The two models are immediately available in Mossy Oak Bottomland. Mossy Oak Bottomland is the pattern that launched the company more than 30 years ago. Toxey Haas designed it based on the appearance of a handful of bark, leaves, and sticks to create a lifelike, legendary hunting pattern. Mossy Oak Bottomland is the epitome of a pattern of success, three decades strong. MSRP varies by model. Available at retailers such as Walmart, Sportsman’s Warehouse, and Cedar Creek Outdoors. Also available online at www.thepocketshot.com. Pocket Shot LLC is an official licensee of Haas Outdoors Inc. Established in 1986, Haas Outdoors Inc. is headquartered in West Point, Miss., and is home of Mossy Oak. For more than 30 years, Mossy Oak has been a leading outdoors lifestyle brand that specializes in developing and marketing modern camouflage designs for hunters and outdoors enthusiasts. The Mossy Oak Brand and patterns can be found on a multitude of products worldwide. Haas Outdoors Inc. is the parent company of Mossy Oak, BioLogic, Capture Productions, MOOSE Media, Nativ Nurseries, Nativ Living, GameKeepers, GameKeepers Kennels and Mossy Oak Properties. Mossy Oak is the official camouflage of the National Wild Turkey Federation, Ducks Unlimited, Quality Deer Management Association, and Mack’s Prairie Wings and the official pattern of B.A.S.S., MLF and Cabela’s Collegiate Bass Fishing Series.